There are several cloud formations that remind you of tangible things, hence, they are named after the object they bear a resemblance to. But there are also clouds whose names are not really fitting, one of which is velum clouds. These clouds normally occur with other cloud types. Learning more about this cloud phenomenon will help you get a better understanding about the type of weather it indicates. Velum clouds are actually accessory clouds which depend on the parent cloud for their formation and continuance. Velum is a Latin word for a ship’s sail, but the name is somewhat a misnomer as this cloud formation doesn’t really look like one. Instead of hanging downwards like a ship’s sail, velum appears as a thin patch of horizontal cloud located either above or on the sides of the parent cloud. It is like a pileus cloud that looks like a cap on top of cumulus clouds but it is less appealing and rather boring. Velum appears in thunderstorm producing clouds such as cumulus and cumulonimbus clouds. This cloud form is characterized by large cottony and puffy cumulus clouds surrounded by a thin sheet of velum cloud. The veil-like cloud is primarily made up of ice crystals. In this cloud phenomenon, the thunderstorm-producing cumulonimbus cloud is wrapped by sheet-like veil. 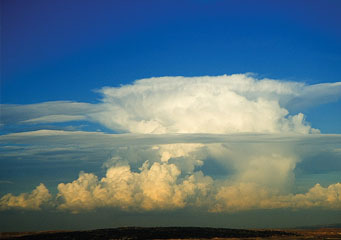 Cumulonimbus velum is relatively uncommon. At What Height is Velum Clouds Found? These clouds may develop either on top or on the sides of thunderstorm clouds. Therefore, they can be found at elevations from 20,000 feet to 30,000 feet above the Earth’s surface. Precipitation may not directly fall from velum clouds but the accompanying thunderstorm cloud can produce precipitation. The cloud is largely composed of ice crystals as it develops in colder regions in the troposphere indicating the presence of turbulence therein. How do Velum Clouds Form? Velum forms when cumulus cloud grows through the cloud layer. It could also be the result of a pileus cap swallowed by the growing cumulus cloud. It occurs as a result of ascend of humid air within the cumulus cloud due to strong updraft. As humid air is forced upwards, it condenses on the upper part of cumulus cloud and continues to grow and becomes a mature cumulonimbus cloud. This strongly indicates the presence of a huge amount of moisture, hence, it is a sign that a severe thunderstorm is coming. What do Velum Clouds Look Like? Velum clouds appear like thin layer or sheet of clouds occurring either on top of the cumulus cloud or loitering on its sides. Unlike pileus clouds, velum is less appealing and even dull. That is why it hasn’t earned high cloud collecting points among photographers and cloud spotters. Even so, they are good indicators of an approaching severe weather system. How common are Velum Clouds? These clouds are common worldwide except in Antarctica. They frequently appear in places where severe thunderstorms such as in America. If you’re overly concerned about the upcoming weather, do not undermine velum clouds as they are good indicators of a developing severe thunderstorm.